The hacking economy continues to thrive. As you can see for the timeline chart below, we have seen data breach headlines in every industry verticals regardless of their size. Cyber-criminals made the most of their opportunities last year, and rest assured it’s unlikely to be any different for years to come. If the fear of a network breach keeps you up at night wondering if you’ve done a thorough job measuring the effectiveness of your cyber-defense system, then you’re in good company. Even a slight doubt about your firewall capability forces you to worry regularly if you are successful as you can be in thwarting preventable attacks on your networks. Burdened with the possibility of having to deal with security incidents, you may ask if there is a reliable way to lessen this anxiety. The good news is the answer is yes! Once a year, leading next-generation firewalls (NGFWs) vendors gear up to participate in the industry’s rigorous security and performance tests, conducted by NSS Labs, a trusted authority in independent product testing. NSS designs various permutations of real-world test conditions and parameters specifically to address the challenges security professionals face when measuring and determining if their firewall is truly performing as their vendor has promised. Upon completion of these tests, NSS publishes a comprehensive result-based report on all participating vendors. Each vendor’s product is ranked either “Recommended,” “Neutral” or “Caution” based on its weighted score across key evaluation criteria including security effectiveness, resistance to evasion, performance, and stability and reliability. A “Recommended” rating from NSS indicates that a product has performed well and deserves strong consideration. Only the top technical products earn this rating from NSS, regardless of market share, company size, or brand recognition. A “Neutral” rating from NSS indicates that a product has performed reasonably well and should continue to be used if it is the incumbent within an organization. A “Caution” rating from NSS indicates that a product has performed poorly. Organizations using one of these products should review their security posture and other threat mitigation factors, including possible alternative configurations and replacement. Products that earn a Caution rating from NSS should not be short-listed or renewed. NSS started this vendor group test four years ago, so it has a significant amount of knowledge and experience in security product testing. Over this period, I have observed many vendors that have moved in and out of the NSS Labs “Recommended” quadrant as NSS’s test methodologies have evolved. This should give you total clarity and confidence toward those vendors with products that have repeatedly and consistently performed well year over year, while providing specific guidance on how to proceed with products that performed poorly or inconsistently. You can find out how your current firewall vendor performed in the latest 2016 Next Generation Firewall Comparative Report – Security Value Map™ (SVM). The SVM gives you a complete scorecard and ranking for each product tested. I urge you to read the entire set of NSS Labs NGFW reports, including the SVM, Comparative Analysis Report (CAR) and product Test Report (TR), to help you evaluate your current security posture and take immediate action where necessary. For four years running, Dell SonicWALL has prevailed in the NSS Labs vendor group test. The Dell SonicWALL SuperMassive™ E10800 is one of only three vendor products to have earned the coveted “Recommended” rating in the NSS Labs Next-Generation Firewall Security Value Map for four consecutive years. This year, the SuperMassive E10800 once again demonstrated one of the highest security effectiveness ratings in the industry, blocking 98.83 percent of exploits during continuous live testing. The device also consistently scored 100 percent effective against all tested evasion techniques and passed all manageability, stability and reliability tests. These are highly credible and verifiable proof points that Dell SonicWALL next-generation firewalls deliver on our product promise, and empowers you to achieve breakthrough performance at unprecedented levels of protection. The same technology is used in Dell SonicWALL SuperMassive, NSA and TZ firewalls, so they are also highly secure. Learn more. 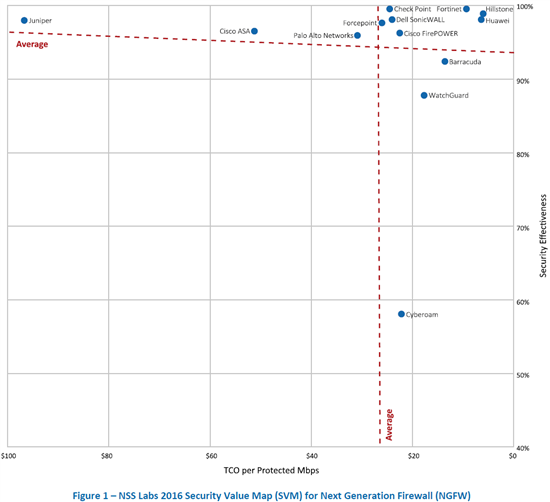 Read the 2016 NSS Labs Next-Generation Firewall Security Value Map SVM Report.